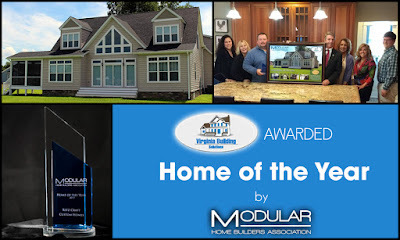 MODULAR HOME BUILDER: MHBA Announces Modular "Home of the Year"
MHBA Announces Modular "Home of the Year"
Virginia Building Solutions and Ritz-Craft Custom Homes have created a masterpiece 2-story on the waterfront, with beautiful views of the Chesapeake Bay from the Northern Neck of Virginia. The Scott Home is custom designed to appreciate the beautiful Bay view right outside. The 3,200 s.f. home features a vaulted great room in which a wall of windows and two triple doors face the water. The focal point of the room is a 20-foot floor-to-ceiling stone fireplace with custom bookshelves on each side. The floor plan also features a master suite on the first floor with a view of the Bay and a tray ceiling with crown moldings and recessed lighting. The master bath includes a large walk-in “infinity” shower. The eat-in kitchen opens to the family and dining rooms and is accented by a generous center island with granite countertops, providing a pleasing contrast to the custom raised panel cherry cabinets. The switchback staircase is open on two sides with custom railings and iron spindles leading to the loft/balcony overlooking the vaulted great room. 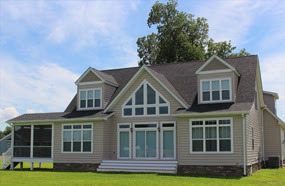 The exterior of the home features a blend of craftsman and waterfront cottage features, including shake siding accents and pvc trim to complete the finishing touches on this idyllic home. The Scott Home best represents the pinnacle of the modular home industry for the year, and we are happy that Virginia Building Solutions was able to feature their home and this award during a recent tour of the company given to Congressman Rob Wittman.